The ClarionSpa Mineral Ball Filter is designed as an ‘in-line fill-up’ filter that can be effortlessly attached to your garden hose. It is positioned between your external mains water supply (outside tap) and your spa or hot tub and should be used when topping up after water has been lost through evaporation and also for fresh filling your spa or hot tub after a quarterly purge and drain maintenance*. 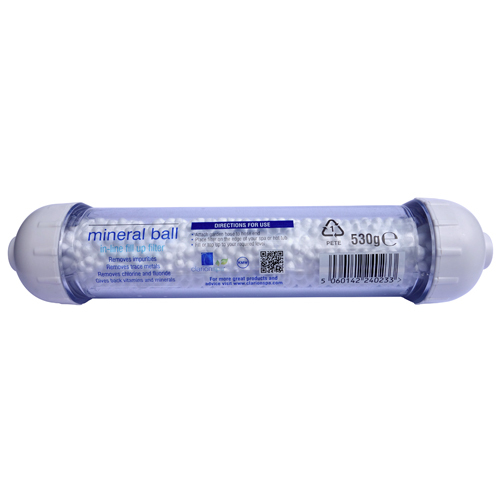 This Mineral Ball Filter reduces the amount of nitrogenous materials found within your household water supply; such as ammonia, which is the main source of sustenance for bacteria. The filter reduces trace metals such as: copper, iron, mercury and zinc, and it will also reduce water hardness, therefore helping to eliminate scale formation. Most existing cartridge filters and water purifiers use ‘Activated Carbon’ as their purifying media, which is not environmentally friendly at all. Here at ClarionSpa we pride ourselves on an eco-friendly philosophy when developing your cleaning products and we use an ‘Activated Ceramic’ purifying media which is environmentally friendly and reclaimed from the tiling industry. We are so proud of this innovation that we have invested in a transparent vessel so that this media is visible to you. Our ‘Activated Ceramic’ media is also penetrated with inorganic minerals. 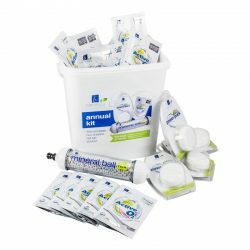 Not only is this beneficial for the continuous maintenance of safe and clear water in your spa or hot tub, but it also benefits you the bather as these active ingredients are absorbed into your body, re-energizing you and replacing vitamins and minerals that your body loses whilst relaxing in warm water conditions. Just one ClarionSpa Mineral Ball Filter has the capability of treating 12,500 litres of water. This equates to a full year of average usage for a spa or hot tub capacity of 2,500-3,000 litres, based on 4 fresh fills plus top-ups. Used in conjunction with our innovative range of highly effective eco-friendly sanitising products we will ensure that you have a clean and trouble free spa or hot tub all year round. Use our EcoPurge Power Puck on a quarterly basis and enhance this even further by maintaining your spa or hot tub with our simple weekly Active Silver Oxygen System. TOP TIP: To ensure the long life of your Mineral Ball Filter, drain it fully and keep it refrigerated between uses. TOP TIP: Once the mineral ball filter comes to the end of its life span, (approximately 12 months from first usage) the 100% degradable mineral balls can be scattered onto your garden boarders, or used in your planters, which will improve drainage throughout your soil and aid in plant growth. TOP TIP: Keep the cover off your spa or hot tub as you re-fill with clean water. This will stop nitrogen in the air, which is the main source of sustenance for bacteria, being transferred into the filling water. * For maximum sanitation we recommend purging, draining and re-filling your spa or hot tub every 3 months. Purge and drain your hot tub using your 100% environmentally free Clarion Spa EcoPurge Power Puck. Clean the spa or hot tub shell thoroughly. Your Mineral Ball Filter comes with a blue insert in one end. You will need to attach a tap connector to this blue fitting which your hose pipe will then connect to. 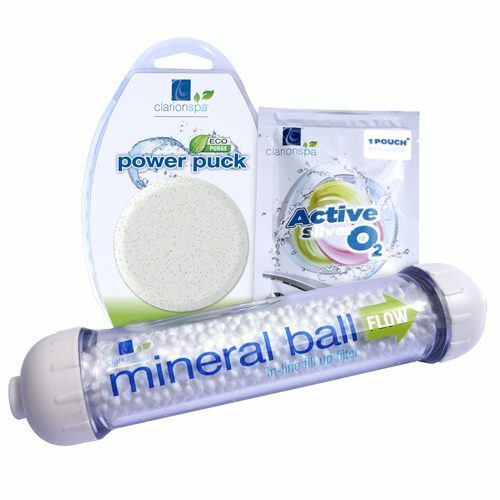 Place your Mineral Ball Filter on the edge of your spa or hot tub. Re-fill your spa or hot tub or just top up to the required level (leave the cover off). Change into your swimwear and fix yourself a nice cool drink. Step into your luxurious hot tub and relax, smug in the knowledge that you have a thoroughly clean and efficient hot tub for another 3 months. You deserve it! Drain the filter and keep refrigerated between uses to ensure its long life. 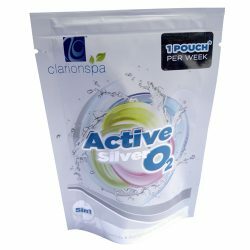 Maintain clean and safe water by using 1 x hassle free Clarion Spa Active Silver Oxygen pouch each week. After a year’s usage scatter the 100% degradable mineral ball filters into your garden boarders or planters to improve drainage, sit back and watch your garden grow! After a year’s usage put the empty vessel into your plastics recycling waste, your conscience is clear!